Laurel and Hardy, the world's most famous comedy duo, attempt to reignite their film careers as they embark on what becomes their swan song - a grueling theatre tour of post-war Britain. Check out Ralph Potts’ Blu-ray review of Stan & Ollie. "The Untold Story of The World’s Greatest Comedy Team"
Obviously, I wasn’t yet born during Laurel & Hardy’s heyday and peak popularity but, I became a fan by seeing their work on television. “March of the Wooden Soldiers” was an annual staple that we never missed and I remember watching the “Laurel & Hardy Laugh Toons” shorts on TV as well. I much preferred their brand of slapstick, brilliant comedic timing and physical comedy to that of Abbot and Costello. I honestly hadn’t heard of Stan & Ollie until I happened to see the trailer on another Sony Home Video release I was reviewing. I was immediately struck by what I saw and was intrigued by the fact that Ollie was portrayed by John C. Reilly. Tried as I might I couldn’t curtail my high expectations and went into viewing hoping that my initial reaction to the trailer would be borne out. Well, it was. I loved every minute of Stan & Ollie. The film takes a snapshot of the iconic comedy team years after their stars have dimmed and finds them trying to rekindle not only their careers but, their fragile partnership which suffered a blow a number of years earlier. There are insights into what made them tick not only as comedians but, as two men that shared a kinship that would endure. It’s a moving tribute that brought back fond memories of watching their schtick and just how damn GOOD they really were. I was blown away by the performances by Reilly and Coogan. Coogan in particular, as he was thoroughly convincing and could literally have been Stan Laurel. 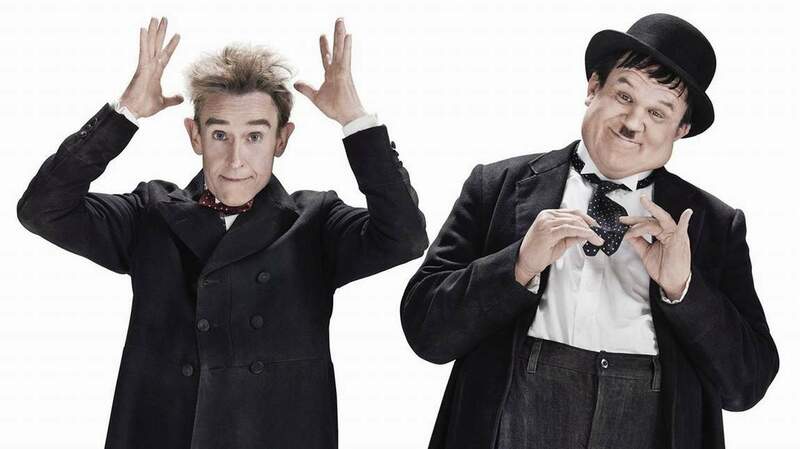 Stan & Ollie is a wonderful film and a must see not only for fans but, cinema enthusiasts. It’s my favorite film so far this year. The rating is for some language and for smoking. 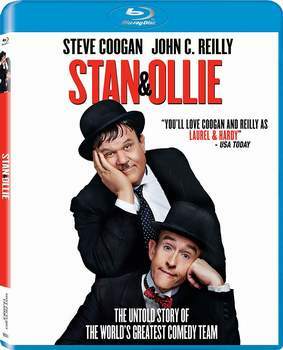 Stan & Ollie comes to Blu-ray Disc from Sony Pictures Classics featuring 1080p AVC encoded video and lossless DTS-HD 5.1 Master Audio sound. This is a terrific and faithful high definition transfer that sparkles on Blu-ray. Images are transparent with exquisite detail and a near infinite sense of depth. Fidelity is never in question regardless of the camera’s perspective. Colors are kept within the scope of the time frame which means lots of browns, grays, greens and blacks. There is a sepia toned aesthetic that permeates many sequences imparting a light monochromatic essence. Whites are snappy and crisp and grays are multi-staged and layered. Blacks are dynamic and stable and contrast is boldly applied without overdriving whites/grays and washing out detail. Every scene isn’t always razor sharp but is pristinely rendered with plenty of subtle refinement that increases the perception of fine detail and depth/dimension. Fleshtones are naturally rendered and appear lifelike. The DTS-HD MA soundtrack features crystal clear dialog, and a subtle, yet engaging surround sound mix. 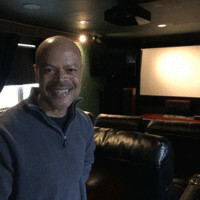 I was impressed with the implementation of both spacial dimension and discrete directional sounds associated with the film’s various venues that created an occasionally immersive listening environment. This worked hand in hand with an appropriate low end and musical accompaniment that underscored the film’s thematic tone. I found this to be a solid audio presentation that complimented the video resulting in an involving viewing experience that enhanced the source material. Stan & Ollie is a moving and poignant snapshot of both the creative marriage and swan song of the iconic comedy tandem of Laurel & Hardy. It comes to Blu-ray from Sony Pictures Classics featuring excellent overall technical merits mated with a worthwhile supplemental package. Stan & Ollie is highly recommended viewing for all of those that appreciate a well-rounded and affecting film experience. johng, Jive Turkey and DistractedforLife like this. Apparently Sony doesn't want anybody to actually buy the BD, since its already sold out everywhere. Amazon says 1-2 months, BB isn't saying anything. Thanks for pointing me to another missed movie, Ralph. I've lost count of how many times you have brought a movie that I knew nothing about to my attention. I too really like Laurel and Hardy comedies and will put this one at the top of my Netflix queue. Seems like a good movie for a family night. Ralph Potts and Eric HA like this. Thanks for the review Ralph. I will definitely be giving this one a spin. Redbox only offers it in DVD format. Sony XBR75-X940D, Samsung UBD-K8500 UHD-BD, Xfinity X1 Voice DVR, Marantz AV-7703 Pre/Pro w/Auro, (3) Adcom GFA-545II amps, (2) Adcom GFA-535II amps for ATMOS speakers. "High Fidelity audio has been like a dog chasing his tail. High Fidelity in my marriage has been much more rewarding because she knows where I sleep." I hadn't heard of this one either, Ralph, but now, after reading your review and watching the trailer, I think this will be tonights rental. It looks great! Thanks for the wonderful recommendation, Ralph. I enjoyed this movie quite a lot. However, as a Canadian who remembers our new flag (with the red maple leaf at the centre and the two red bars left and right) replacing the red ensign in 1965 I found it somewhat amusing that it appeared near the end of the movie flying in front of the hotel (two separate scenes) they were staying at in London in 1953. Oh well, the fact checker can't get everything right. It kind of took me out of the movie or a few seconds. Bought and watched this on iTunes last night and enjoyed it very much. Also another movie I would not have known was out there without a review here on AVS. Thank you. On a personal note it was special to me because these guys were my Father's absolute favorite and brought back memories of watching their old films on TV as a kid. He always referred to them as 'Fat & Skinny'. I don't know if that was a common name for them or something he made up. iTunes has theirs films in HD so I plan on watching more since I haven't seen any of them in many many years. So glad to hear this! I saw a preview of this a while ago in front of another movie and hoped to catch it when it was in theaters, but it must have been very limited release. I had high hopes for this one also as it looked really good. Now have to plan on catching this soon. FWIW, Amazon just shipped me one of these BDs, so they are starting to show up again. Blu-ray from Amazon arrived this morning and we watched it this afternoon. Really a great movie and well done, speaking as someone who has followed Stan and Ollie since the early 1960's, when living in Los Angeles and their movies were shown pretty much weekly on TV. Learned quite a bit about what they went through during their film work, some of it sad. If you're fan, this is a must see/have movie. Thank you Ralph for the review, which brought the movie to my attention. You're very welcome Rod. So glad you enjoyed it as well.. I too must see this film, thanks for the review. I bought the Essential L&H DVD box set several years ago. Fabulous. The transfers are all pristine. No dirt and noise on the movies. This 10-disc set includes most of Laurel & Hardy's talkie shorts and features produced by Hal Roach between 1929 and 1940. These are among the funniest comedies ever made, as many vintage-film buffs will agree. Laurel & Hardy were often capable of carrying the action almost entirely by themselves: BRATS has Stan and Ollie as themselves and their own sons (with giant sets and trick photography); THE MUSIC BOX is the Oscar-winning featurette with the boys as the world's worst piano movers; HELPMATES has Stan helping Ollie to clean house after a wild party; THEIR FIRST MISTAKE has our heroes adopting a baby; TOWED IN A HOLE has them rehabbing a boat; BUSY BODIES turns them loose in a carpentry shop. You'll see dozens of examples of how inventive they were with pantomime and dialogue. Their short subjects were so successful that they branched out into full-length features, including their famous hits WAY OUT WEST and SONS OF THE DESERT, the prison comedy PARDON US, the "gypsy" comedy THE BOHEMIAN GIRL, the hour-of-sight-gags BLOCK-HEADS and SAPS AT SEA, and several others, including both versions of A CHUMP AT OXFORD (the standard 63-minute print of 1940, and the 42-minute, differently edited "streamliner" released in 1943). The supporting casts read like a who's-who of familiar faces: Edgar Kennedy, Billy Gilbert, Charlie Hall, James Finlayson, Mae Busch, Anita Garvin, Walter Long, Harry Bernard, Eddie Dunn, Daphne Pollard, and a host of others. You'll be laughing through 58 L & H comedies. The wonderful news about this set is that the DVDs are presented in high definition, from the original surviving 35mm film elements. They are NOT taken from RHI's tape transfers that aired on AMC in the 1990s, or the broadcast masters prepared in 1986 for TV's "Laurel & Hardy Show" (some of which are still playing on TCM, and often in shortened form). The DVD producers went back to the source materials, meaning that the vintage Laurel & Hardy comedies have never looked or sounded better on video. The DVD producers have taken some pains with the restoration: picture and sound have been cleaned up digitally; most of the subjects feature the attractive, seldom-seen original titles; and even individual shots cut short in current prints have been restored to their original lengths. Watched this tonight. What a delightful story, superbly told.